Most of us, now reading ebooks on different devices like mobile phones, iPads, Kindles, tablets and conventionally on Laptops. With different types of ebook formats and devices, there are compatibility issues which can be solved by free eBook converter. Hamster Free eBook Converter is most popular eBook Converter. It is compatible with all welll known formats available . It is very easy to use , works on drag-n-drop procedure. It integrates itself with Windows. First, Add all the files you want to convert. 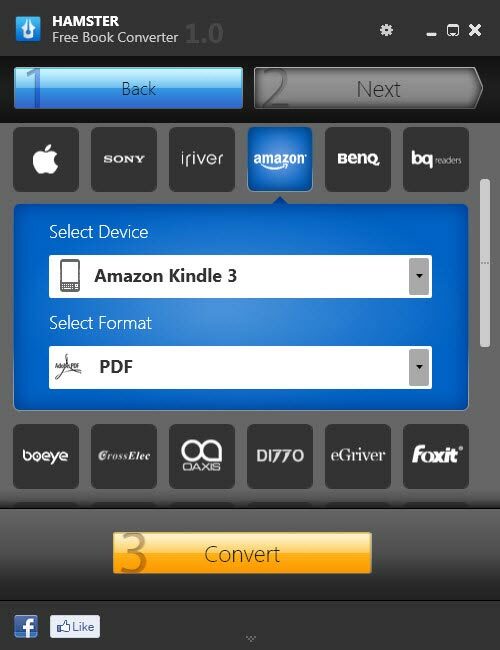 Select the device for which you want to convert books (More than 200 options available) and select the output format. Now, specify the folder where you save the new ebook, Now press convert.